Would You Know a Pitbull If You Saw One? If you wouldn't know a pitbull if you saw one, you're not alone. Pit bull is actually not a breed of dog. 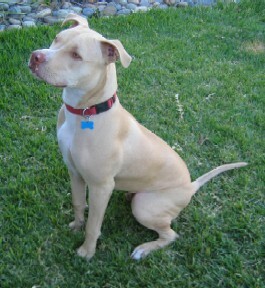 Instead, the term "pit bull" refers to not one, but three dog breeds. Add to that, the fact that there are over twenty different dog breeds that are regularly mistaken as being pit bull and you can see how easy it becomes to mis-identify them. The three breeds that fall under the pit bull umbrella are the Staffordshire Bull Terrier, the American Pit Bull Terrier and the American Staffordshire Terrier. One quick way to keep them straight is to think "small, medium and large" in the order listed above. Some people feel that the American Pit Bull Terrier and the American Staffordshire Terrier are essentially the same breed. And indeed, many owners are now getting dual registrations on the same dog. 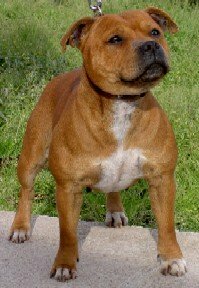 Registering the dog as an APBT with the United Kennel Club and as an Amstaff with the American Kennel Club. Here is a picture of each type of pitbull dog grouped together for comparison. So what do you think? Are the APBT and the Amstaff essentially the same breed or not? My point is not really to debate that here. After all, if the experts can't agree, why should you or I lose sleep over it? But, if you ever find yourself locked in a room with a pitbull aficionado, at least now you can perhaps hold your own. Aside from the pretty obvious differences in sizes, there are some very striking physical similarities. And the ancestries of all three breeds are very much intertwin. The pitbull head is often described as being wedged-shaped. But, I think spud-shaped is really more descriptive. The eyes are wide-set. There's the signature strong jawline and muscular body. The ears when left natural (as they are in the above photos) are either rose or half pricked. Some breeders do still like to crop the ears. It's a matter of personal preference. And, personally I prefer natural for two reasons. First, I just think natural ears look better. As my husband says, "They look so militant with their ears cropped". Secondly, the cropped ears and docked tail are vestiges of the breed's fighting days when cropping and docking had practical value because it gave an opponent less to grab on to. Now that dogfighting has finally been outlawed in most countries, there's just no need to do it. So, do you think you'd be able to recognize a pitbull now? If you want to test your mettle, you can play Find the Pitbull. But, a word of caution--don't get discouraged. Few people get it right the first time. 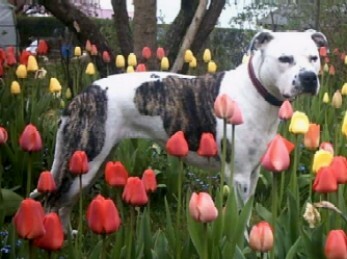 Here's a hint: the pit bull you are looking for in this game is an American Pit Bull Terrier. Good luck!